This year's lineup is one of the best I've seen for a Stockton Calling with the likes of The Lighting Seeds, We Are Scientists, The Spitfires and Twisted Wheel just some of the artists to grace the stage come March 31st. I for one am very excited to see the return of Manchester powerhouse Twisted Wheel who burst onto the scene back in 2009. Originally a three piece The Wheel took the nation by storm with their debut single, 'We Are Us' which earned wide critical acclaim. Fast forward a few months and several energetic live shows later The Wheel were asked to support Oasis on several dates across their 'Dig Out Your Soul' tour. Noel and Liam were very impressed by the trio and Twisted Wheel successfully wrote themselves into Oasis history. It's 2018 and Johnny Brown is determined to make a success of the band and I for one am right behind him. We Are Scientists come to town with their back catalogue of Indie hits which everyone knows at least one of! They're sure to play a stellar live set which will be a great end to the festival. Another headliner come in the form of The Lightning Seeds, the 90's favourites have plenty of tunes in their locker including 'The Life of Riley' and the well-known England singalong 'Three Lions'. With the World Cup quickly approaching I'm sure many will partake in an alcohol fulled singalong for this tune. Warrington's 'Man and The Echo' are another band among this already beauty line up. Originally called 'Cheap Cuts' Man and The Echo continue to supply their listeners with soulful grooves which make the ears perk up in delight. They've got a great catalogue of tunes from their self-titled debt LP which was released in 2016 and sounds as fresh then as it did now. 'Distance Runner' , 'Operation Margarine' are just two tracks to listen out for, they're sure to impress any new head who happens to be in the Georgian when they're on. Scottish boys Vida return to Teesside since their support slot with The Sherlocks in Feb 2017. These lads are a band on the rise and they proved back in Feb 17 to Teesside's finest that they were as good as if not better than the 'headliner'. Frontman Jamie Pollock is proving himself as one of the best, young Scottish songwriters out there at the moment in a time when Scottish bands are on the rise again. Sunderland's best music outlet at the moment come in the form of 'Social Room' who's huge indie guitar anthems grab the listener and transport you back to a time when frontmen who didn't play guitar were all the rage. Matt and the boys have some big tunes and are determined to make 2018 a success. Alongside all the talent that's travelling from far and wide there's the usual host of local bands on the bill. Cape Cub, Tom Joshua and Dylan Cartlidge are just a few of the many who are worth a mention. 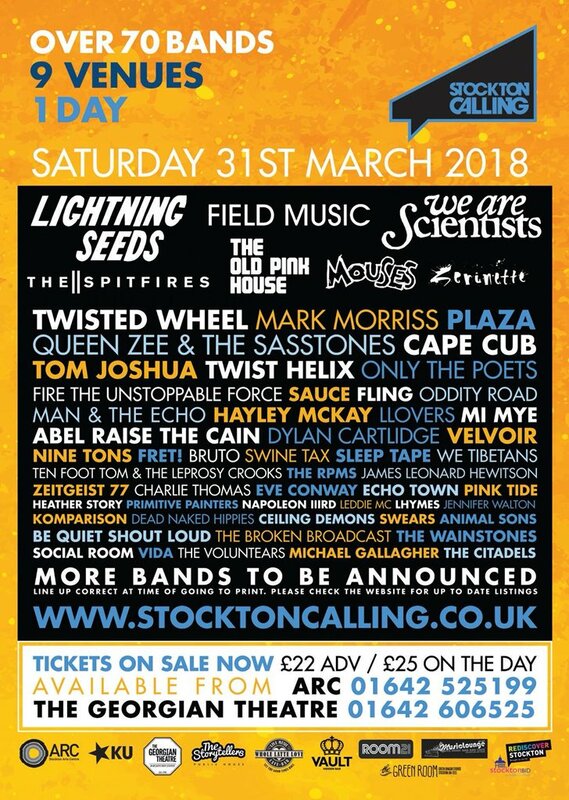 Saturday 31st March 2018, a day of great tunes, beers with mates and a warm, loud atmosphere from some of Teesside's finest. Be there yeah! ?